August 11, 2018 Fallout 76’s wanted system will pull bounties from offending players’ own pockets. Today’s QuakeCon Q&A brought a bunch of nitty gritty Fallout 76 details, including exactly how the wanted system will work. We knew players who abused PvP would get bounties placed on them, but now we know what that means – as well as the fact that there will be some deliciously stiff penalties for griefers. If you kill somebody who doesn’t want to get into PvP, you won’t get any experience or cap rewards. Instead, you become a “wanted murderer.” Your location is marked with a red star on the map, visible to all players on the server. They’ll be able to quickly track you down and attempt to claim the bounty, and if they do, they’ll claim a cap reward straight out of your own pocket. 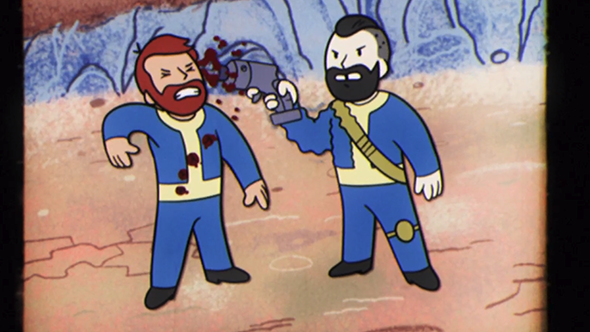 Bethesda says there’s no true way to prevent people from being assholes online, so “We turn the assholes into interesting content.” If you missed earlier details on how Fallout 76 PvP works, it basically starts with low-damage attacks from one player against another. If both players want to fight, they can – but if one keeps harassing an unwilling participant, that’s when the wanted system comes into play. We already heard in a Noclip documentary that a wanted system of some kind would exist, and that griefers won’t be able to take your possessions, so it’s clear that Bethesda are taking this problem seriously. For the Fallout 76 release date (oh go on then: it’s November 14), perk cards, quests, setting details, trailers to watch, and plenty of other tidbits, hit that link.